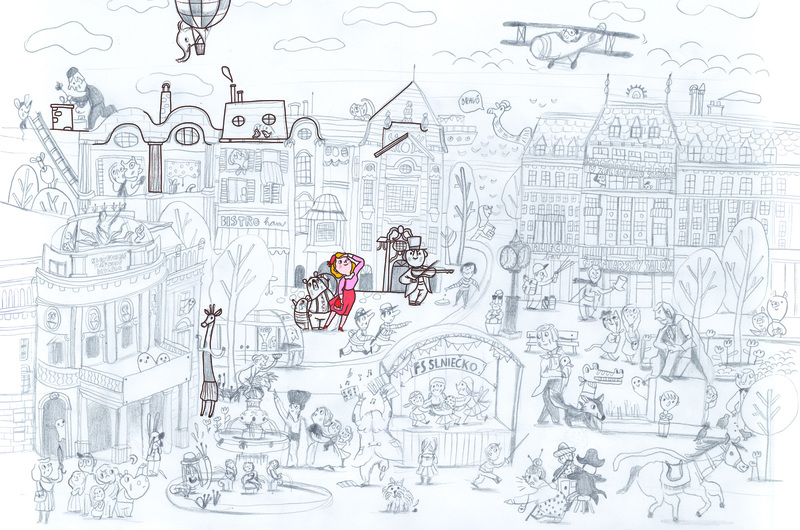 A mother and daughter stand behind the project of a illustrated children’s book about Bratislava. Both are passionate travellers and admirers of beautiful children’s books. At home we have found that we stocked many foreign children’s books that not only the kids, but as well we the adults enjoyed while reading together. While Martina travelled with her kids Stela 6 years old and Félix 4 years old, she found out that it was best to be prepared for a foreign destination. The kids loved colourful illustrated books in which they saw cities like Paris or Vienna. In this way they quite naturally got to know a lot of interesting personalities from each city or country and the biggest bonus was when they actually found familiar monuments, streets and buildings while exploring the cities, thanks to the book. This is when the idea was born to make an book about Bratislava, as our kids naturally asked many questions about the city they live in. In the beginning it was only an audacious idea. Both of us come from other professional fields and we have not had any own experience with publishing of books. Over time the idea changed into a dream, and there was no way back. Martina founded a small family publishing house called Minimalist. We took obstacles as a challenge and a chance to learn new insights, but mainly a big step towards the successful finish of our project – an illustrated book about Bratislava, in which small young readers (but also adults) learn in a playful way, through interesting stories of the main characters about important natives and famous people in Bratislava, historic buildings and traditional specialities (Bratislavský rožok). Today, one year from the first draft and the meeting with the talented illustrator Mária Neradová, is our dream slowly becoming reality. The book is finished and had gone through graphic design by the well-known graphic designer of children’s books Martina Rozinajová. At this time we have launched a crowdfunding campaign at www.startlab.sk to collect funds for printing the book.